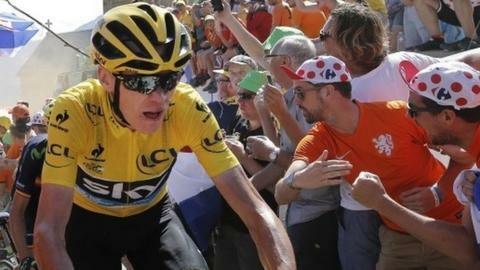 Chris Froome admitted he was "in difficulty" and feared he could lose the Tour de France on the "hardest climb" of his career on Alpe d'Huez. The 30-year-old was put under pressure by rival Nairo Quintana on the final mountain climb of the race but limited his losses to retain a 72-second lead. Froome, who is set to become the first Briton to win two Tours in Paris on Sunday, said: "I was on my limits. "There was a moment I felt 'this could go the other way, I'm in difficulty'." Froome led Colombia's Quintana by two minutes and 38 seconds going into Saturday's penultimate stage. Movistar rider Quintana attacked on the 13.9km ascent of Alpe d'Huez and opened a 30-second lead on Froome, who was being paced up the mountain by Team Sky team-mates Richie Porte and Wouter Poels. France's Thibaut Pinot won the stage with Quintana picking up six bonus seconds to add to the 80 he finally finished ahead of Froome. "I had a lot of emotions going through my mind," Froome continued. "I was on my absolute limits. I felt like I was dying a thousand deaths up Alpe-d'Huez, but being with team-mates makes it a lot more manageable. "I had a little bit left to do the last kilometre and try to limit those losses." Froome has had a torrid Tour in which he has been spat at, had urine thrown at him, and faced accusations of doping and of riding a motorised bicycle. He said: "It's overwhelming. We've been up against it all. "There's been so much going on in the background, away from the race, which could've taken a lot of focus away from what we needed to achieve. "It feels as if we've been up against everything these last three weeks and to have still come out on top, it's unreal. "To have won the Tour once was a dream come true. To come back and do it a second time, that's more than I could ever have imagined." Team Sky principal Sir Dave Brailsford said Britain "does not have many champions" like Froome who is a credit to the nation. He said on ITV4: "After everything he's endured, he has shown his real mettle. "The way he puts up with the abuse he gets, he's so composed. A true champion. Britain doesn't have many champions like this fellow. "I don't think many people get to see what we see every day. He's a deserved winner and a credit to Britain. "Chris is the most unbelievable competitor and polite, nice guy off the bike but on the bike he's the most resilient character. "I don't think I've ever met anybody like him. He's perfect for the job, as it were. He deserves more credit than he gets."